I was unhappy with my former profession, which took a toll on my relationship, and I decided that I needed to do something to bring happiness back into my life!! It was Yoga! The ability to be able to share it with other people brings me great joy, peacefulness, and enjoyment everytime I get to teach a class. The journey that Melody led me through and taught me was absolutely Amazing and I learned so much!! I sooo appreciate her for it every day!!!! This training is about more than learning to teach a yoga class, it’s about – how to live an authentic life, inspire your students and communities, and how to lead both on and off your mat. Led by Melody Van Kay you will get the hands-on experience, necessary tools, and develop the confidence needed to teach both Classical sequence and Power Vinyasa classes. You are ready now!! Dates are flexible. We can work with what works for you, though you are required to be at every agreed upon session or will need to arrange make-up time at extra cost. Each day will begin with meditation followed by practice. We will have a short break to replenish then move into Yoga studies. During your lunch break you will have reading and handbook work to complete. We will follow up with a group discussion and inquiry sessions. Another practice session follows with a short break to replenish. Your day ends with partner work and student teaching. Snack(s)/Meals - we will have short breaks each day and a lunch break. Receive $499 off your tuition by being one of the first 10 enrollees when you submit your application and non-refundable $500 deposit. *$500 deposit due with online application. Payment arrangements can be made. Full participation and attendance are required. Melody’s vision for building an authentic, welcoming Yoga community led her to purchase Island Salt Air in 2018. She is an accredited Baptiste Power Yoga instructor, Yoga Alliance nationally certified E-RYT200, and a Continuing Education Provider. She developed and continues to lead Island Salt Air Yoga 200 hour Teacher Training, the first Yoga Alliance Registered Yoga School in Galveston Texas. 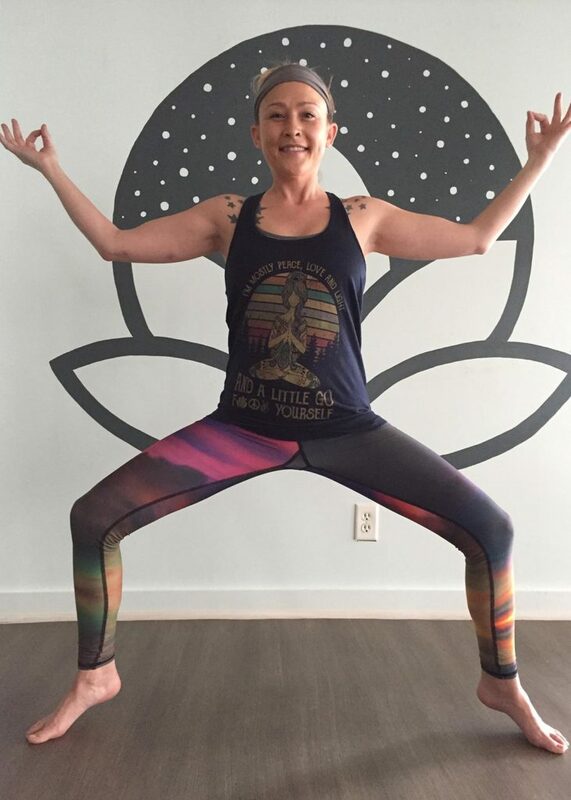 In her yearning to deepen her practice and knowledge of yoga, Melody studied with the Baptiste Power Yoga founder Baron Baptiste to complete Level One Certification and continues to study under Baron and his Master teachers in advanced leadership trainings. After many years of practice and study, Baptiste Power methodology became evident as her personal platform for connection. The Baptiste principles give a place where we can show up as our authentic selves. The guiding principles of Baptiste Power Yoga are truly about living the practice off of the mat. Melody’s vision is to bring this to others. Working from true authenticity the possibility of great things becomes a reality. She believes that through our physical practice of yoga the real work of yoga begins; training the mind to act with intention, compassion, and grace in all situations. She believes that what we learn on the mat transforms not only our physical bodies but allows us to gain a deeper connection to our true selves, the powerful, loving being within all of us. Have questions or concerns? Call & ask!